304 pages | 60 B/W Illus. Computer simulations based on mathematical models have become ubiquitous across the engineering disciplines and throughout the physical sciences. Successful use of a simulation model, however, requires careful interrogation of the model through systematic computer experiments. While specific theoretical/mathematical examinations of computer experiment design are available, those interested in applying proposed methodologies need a practical presentation and straightforward guidance on analyzing and interpreting experiment results. Written by authors with strong academic reputations and real-world practical experience, Design and Modeling for Computer Experiments is exactly the kind of treatment you need. The authors blend a sound, modern statistical approach with extensive engineering applications and clearly delineate the steps required to successfully model a problem and provide an analysis that will help find the solution. 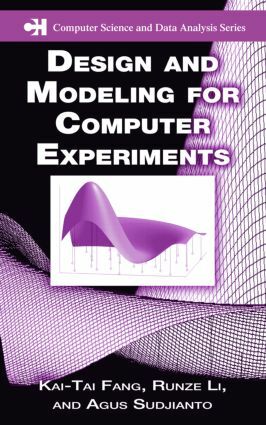 Part I introduces the design and modeling of computer experiments and the basic concepts used throughout the book. Part II focuses on the design of computer experiments. The authors present the most popular space-filling designs - like Latin hypercube sampling and its modifications and uniform design - including their definitions, properties, construction and related generating algorithms. Part III discusses the modeling of data from computer experiments. Here the authors present various modeling techniques and discuss model interpretation, including sensitivity analysis. An appendix reviews the statistics and mathematics concepts needed, and numerous examples clarify the techniques and their implementation. The complexity of real physical systems means that there is usually no simple analytic formula that sufficiently describes the phenomena. Useful both as a textbook and professional reference, this book presents the techniques you need to design and model computer experiments for practical problem solving. ". . . very well-organized text . . . makes a very valuable contribution to the field. I highly recommend it for anyone trying to learn design and modeling techniques for computer experiments. In particular, it will be a useful professional reference for scientists and engineers in practicing computer experiments, a comprehensive resource book for statisticians interested in developing new techniques for designing and modeling computation experiments, and an excellent book for undergraduate and graduate students. The authors’ careful and thorough presentation style makes the book a very enjoyable read."